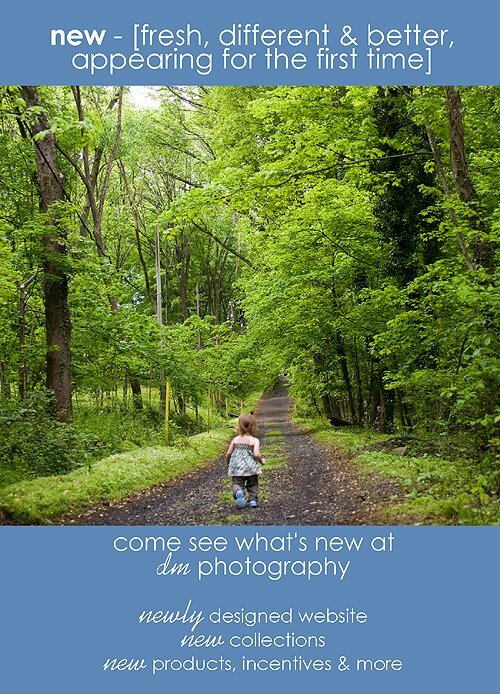 To finish out my Christmas In July event, I'm happy to show off my new and improved website(http://www.dmphotos.net/). I've updated the look of it to match my brand a little better. And all of the galleries have been undated and include photographs from all of the sessions over the past year (yes, its been that long since I've updated it!!). Although I thought I tested it (many times), there seem to be a couple things I need to fix, so please be patient as I work to correct those tonight!! :) In addition, some of the web galleries are missing, I'm working on that too!! Man - technology is a HEADACHE! In addition to the prettier website, I'm also happy to announce that I am now offering collections. Collections are a great way to purchase many of the art products (canvas, collages, albums and books) at a discount. Lastly, to keep up with the digital age, I'm now able to accept credit cards. If you've made it this far...its time for presents (I know, its not really Christmas without some sort of gift-giving). So leave a comment here to win a $10 Starbucks gift card. If there are more than 20 commentors, two $10 gift cards will be awarded. Winners will be chosen at random (I'll announce the winner tomorrow morning). Woo Hoo! LOVE the new site! I especially love your "About Me" page...it's all so true!! Great job, I can't even imagine the amount of work it must have taken to do all that, you're a better woman than I! Looks fantastic, DM :) And your captions are perfect for the pictures that you selected in your intro! Quick question--are there links to the galleries from your website? love the new site, love the me page, and so true, cant wait to see more new pics from your 30 min. sessions. Great new website, looking forward to a session in October- still get rave reveiws from last year's session-hope we can top it! We now have 2 boys to get to sit still-yeah!- forget the dogs! I love the new website dm, you rock! Thank you everyone for all of the kind words. Makes the hard work seem worth it!